It’s a bloody showdown on Arcadia’s rooftops as X is assaulted by the pig- faced Berkshire, a maniac who can no longer feel physical pain! As Leigh fends off a swarm of the city’s thugs, Berkshire shatters the lock around X’s neck . . . and the mask finally comes off! As we left off last issue, Mr. Berkshire, now with a Pig’s face, as cornered X with a shotgun. 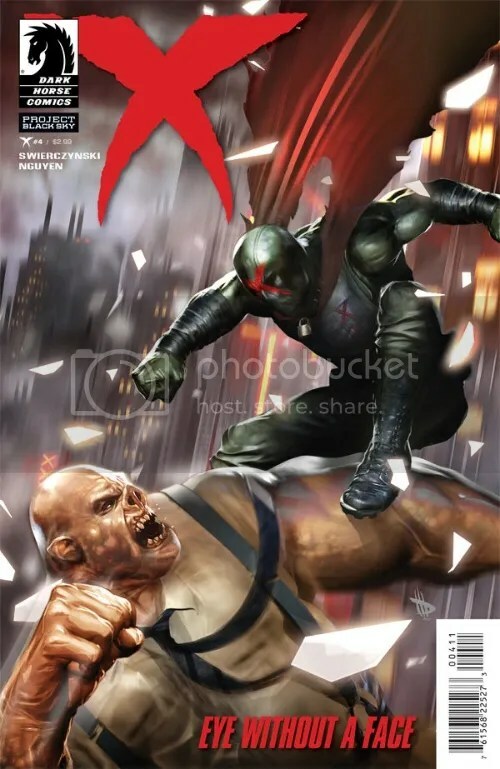 He shot him in the chest, knocking him down (X is still alive thanks to his bullet-proof vest, of course, but he’s hurt) and prepares to shoot off the lock that X has around his neck to keep his mask on. Leigh makes a run for it, trying to get off the roof of the building that they’re on, only to run into another batch of Bershire’s hired thugs, who turn out to be cousins of the thugs that tried to kill her last issue, whom X killed. And they’ve got axes. The next several pages switch back and forth between Leigh trying to outrun the thugs, and brutal (& I mean BRUTAL) fist fight between Berkshire and X. Leigh manages to lock the thugs behind and door and get back to where Berkshire and X are fighting, just in time to see Berkshire rip off X’s mask. Neither we the audience, nor Leigh, get a clear shot of X’s face here. But Berkshire reacts in shock, he clearly recognizes X, and says he can’t believe that it’s HIM. He even mentions taking him out for a beer, indicated a close relationship between the two. He then taunts X by saying that after he kills X he’s going to kill everyone X has ever known. But just before Berkshire can deliver the killing blow, Leigh throws a fire extinguisher at his head, giving X a minute to recover and counter-attack. X then shouts that the reason he locks on his mask is not to protect his identity, but to remind him to hold back. And then he bites off Berkshire’s (who he calls by his first name, George, again indicating a close relationship) pig nose. The thugs break through the door and come after Leigh, but she picks up Berkshire’s shotgun and shoots at them, chasing them off. When she turns around again, X is gone, and Berkshire’s dead body is laying there, in a pool of blood, with his nose bit off. It’s gross (but in a good way). The next day (captain says it’s Day 10, so it’s only been 10 days since X began his vigilante campaign back in X #0), Leigh is ready to give up. She goes back to X’s hideout, and surprised to see him there. He tells her to leave Arcadia, but now that she knows X is going to continue fighting, she offers to help him. Even with Berkshire and his associates dead, there are other corrupt officials in the city, and she offers to help him find them, using her old leads from her days as a reporter. He accepts, puts his mask back on. And thus, a new partnership begins. Wow, what an immensely satisfying conclusion to this first arc. I don’t know how many adjectives I can use to praise Duane Swierczynski’s writing on this title. But he just makes every character in this title feel so real. And I’m so wrapped up in the story that I don’t even mind that he’s continuing the mystery of who X really is. I hope he drags it out as long as he needs to, and lets this story evolve at its own pace. And much praise to the art team of artist Eric Nguyen and colorist Michelle Madsen. They really help bring this story to life. When X and Berkshire are fighting, it’s far from the clean skilled fights of Batman vs. The Joker, where we see Batman taking down a gang of henchmen without breaking a sweat. The fights in this book are dirty and bloody just like real fights look. And all wrapped up in a series of beautiful covers by Dave Wilkins. This books is the best!